American Go Association pro Ryan Li 1p, of Canada, has defeated two-time world champion Chen Yaoye 9p in the second round of the MLily Meng Baihe Cup World Go Open Tournament. Li, who the day before defeated Cheng Honghao 2p in a 363-move game, played as black against Chen. 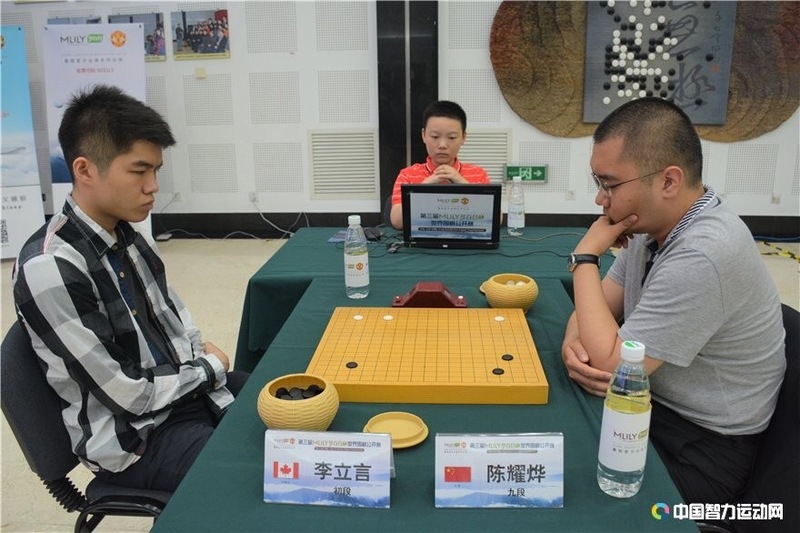 After a fierce middle game fight, Li (left) settled his groups and took a small lead. The two got into a lengthy ko fight but Li held on to win by 2.5 points at the end of the 327-move game (see game record below). The four-and-a-half-hour game was broadcast live on the AGA’s YouTube channel with commentary by Jennie Shen 2P with Andrew Jackson, and can be viewed here. The 27-year-old Chen’s accomplishments as a pro include defeating Lee Sedol 9p in the 2013 Chunlan Cup and Ke Jie 9p, the top current player, for the 2016 Bailing Cup, as well as winning 17 other national and continental titles. Li, who is currently pursuing a Ph.D. in earth sciences at Yale, became the fourth AGA-certified pro in 2015. He has represented North America several times and scored wins over Asian pros before, including defeating Japan’s young talent, Mutsuura Yuta 2p, in the 2016 IEMG in China. He will face Li Xuanhao 6p on August 24 in the top 16 of the MLily Cup. The winner receives about US $260,000 USD and the runner up close to $90,000.